What Happened to Sheriff Buford Pusser? What is the Fastest Animal in the World? What Happened to Pablo Escobar’s Wife? What is a Sand Dollar? What is a Sheepshead Fish? What’s the Best Gay Anime? Why Did Steve Carell Leave ‘The Office’? Why do People Hate Nickelback? Are Costco Cakes Worth It? Curious about sand dollars? You’ve come to the right place! We explain all there is to know about these alien-like sea creatures in today’s Know More Stuff article. We recommend the detailed answer if you have a thirst for knowledge. Ready for some sand dollar facts? So, what are sand dollars? Sand dollar: a species of burrowing sea urchin. If your curiosity hasn’t yet been satisfied, then read on, as we discover all about these strange looking creatures. You really don’t want to miss out on how they protect themselves…. The sand dollar is a burrowing sea urchin of the order (family) Clypeasteroida. A sea urchin (or echinoid) belongs to a larger group of animals called Echinoderms. This group of animals include starfish, sea cucumbers, brittle stars, feather stars, and sea lilies. The Clypeasteroida family also contains sea biscuits. The two species are grouped together due to their similar shape. The word Clypeasteroida is derived from Latin, where “clypeus” means round shield and “aster” means star. The Echinoderm family contains sea urchins, sea cucumbers, starfish, sea lilies, brittle stars, and feather stars. But what do they all have in common? They live in marine water. They have a total of 5 planes of symmetry. They have skeleton consisting of calcarous plates. They also have stereom, which is a sponge-like substance. They use an internal water vascular system. This is the system that controls locomotion, waste transportation, food, and respiration. Why are Echinoderms so important? They have been on Earth for around 530 million years and evolved in many different ways over this time. The fact that they have been around for so long means that they are incredibly adaptable, durable, and plain amazing animals. They are so important because we can study them (and the way they have evolved) to learn about the environment as far back as 530 million years ago. The fact that they are also very commonly found fossils (due to their strong structures) means studying very old specimens isn’t as problematic as with some species. Echinoderms are a glimpse into the ancient past, and they far outlive the human species! 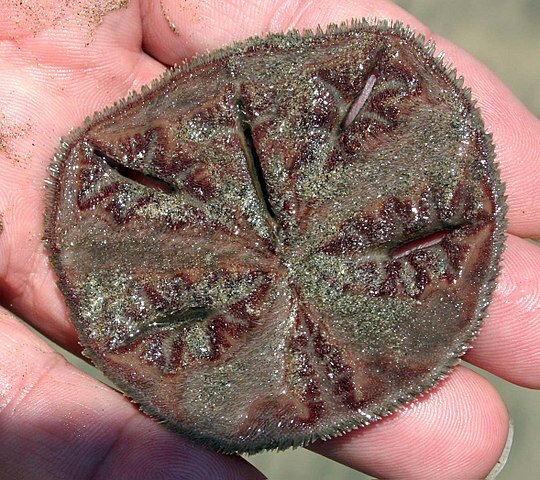 How do sand dollars get their name? Their flat, round shape resembles a one-dollar coin. A sand dollar is a sea urchin, which is also known as an echinoid. Why are they shaped this way? 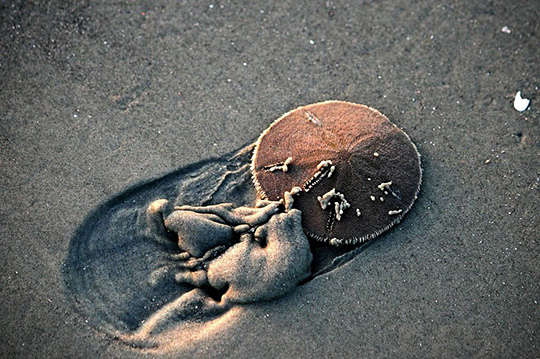 Sand dollars live just below the shallow water line or in moist, muddy or sandy areas of beach. They feed on algae, diatoms (microalgae), detritus (dead organic material), copepods (small crustaceans), and crustacean larvae that are located just below the surface of the sand and mud. To reach their food they need to burrow beneath the surface of the sediment. This is where their shape becomes very useful. The underside of the sand dollar is flat and covered with tiny, soft spines. These help it move slowly along the sand, while any food is fed into the mouth opening in the center by small hairs (cilia). This is in stark contrast to the long, prickly spines of some sea urchin species. Besides being used as legs to move, the sand dollar’s spines also help it to stay clean of dirt, sediment, and parasites. By staying clean it can absorb as much oxygen as possible from the water. As they crawl along the seabed, their little feet and fine hairs (cilia) pass fine sand along grooves towards the mouth in the center. The food is separated from the sand, and only the good stuff is ingested. As we mentioned earlier, their favorite foods are algae, small crustaceans, dead organic material, and crustacean larvae. They can be either male or female just like us. The female releases eggs into the water, which are simultaneously fertilized by the male sperm. When the fertilized eggs hatch, they become larvae that look nothing like the adult sand dollar. These larvae are only symmetrical on 2 planes (as opposed to the 5 plane symmetry of the adults), and have many long arms. Eventually, they metamorphize into the shape we are familiar with. Sand dollars have separate genders and are usually either male or female. They practice external fertilization, releasing eggs and sperm simultaneously into the water. They are thought to be prey for sunflower starfish, ocean pouts, some sea snails, and skates. How do they defend themselves? Well, the sand dollar larvae have a pretty amazing method of self defense. Scientists have discovered that 4-day old larvae can actually clone themselves in the presence of a predator. Within 24 hours of sensing a predator’s fish mucus in the water, an exact replica is produced. The process causes the original larva to shrink to around half its size and the new larva to be even smaller than this. But, you do have 2 chances at life! Though sand dollars live on beaches around the world, in certain places they are becoming less common and even rare. The main threat to them is habitat loss. The encroachment of human activities on coastlines, pollution, as well as the changes in climate, make this a crucial time for echinoids. How do you tell a live sand dollar from a dead one? You usually see sand dollars at the beach in 2 very distinct colors. There are those that are dark in color and those that are white. Those that are white are usually dead, and have become this color after being exposed to lots of sunlight. However, this isn’t a definitive rule, so you should check in other ways before you touch it or take it as a souvenir. A live sand dollar will have a velvet-like covering composed of thousands of tiny hairs. It uses these to breathe, eat, and move. Without them it cannot survive. If a sand dollar is alive it will be velvety and dark. Those bleached white sand dollars that you find washed up on the beach are usually dead. Check the surface for hairs and the underside for tubes and hairs. A rough rule is: Leave the dark colored sand dollars alone! That’s all for our sand dollar special. 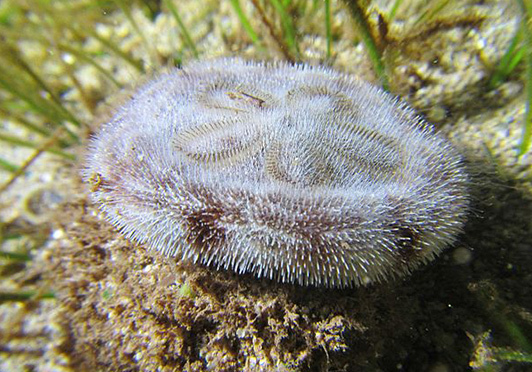 So, next time someone asks “What are sand dollars?” You’ve got absolutely no excuses! If you enjoyed this article then we’re pretty sure you’ll love our post on the fastest animals too. Until next time! Stay curious. Tell us what you think down below! © 2018 Knowmorestuff.com All rights reserved. Knowmorestuff.com is a participant in the Amazon Services LLC Associates Program, an affiliate advertising program designed to provide a means for website owners to earn advertising fees by advertising and linking to amazon.com, and any other website that may be affiliated with Amazon Service LLC Associates Program.